PMBOK® Guide Sixth Edition defines risk mitigation as “A risk response strategy whereby the project team acts to decrease the probability of occurrence or impact of a threat. It is important to understand that the aim of Risk Mitigation is to bring down the risk exposure within the acceptable threshold limits. The risk exposure is the function of the probability of occurrence of the risk and the impact of this risk on the project. Now, you need to understand, since, mitigation strategy is all about taking advance and proactive actions, the probability of occurrence of risk and its impact is identified and calculated at an early stage so as to prevent the foreseen damage to the project. In short, risk Mitigation follows ‘Prevention is better than cure” dictum. Risk responses identified using contingent response strategy is called contingency plans. PMBOK® Guide Sixth Edition defines Contingent Response as “Some responses are designed for use only if certain events occur. Contingency responses are the ones that get executed only when certain unwanted events occur. You do not execute contingency responses unless you see a warning sign that some risk is about to occur. Now, take note we only execute contingency responses when sufficient warning signs are given. It is mandatory to track and define the triggers of the contingency response. It’s often observed that test takers consider these two risk plans as mutually exclusive, which however is not the case. At times, you may have to plan both the mitigation risk response and the contingency response alongside. In such urgent situations, you have to make a proactive plan of actions to reduce the probability and impact of the risk and also stay prepared with the contingency plan and monitor triggers or warning signs in case the risk is inevitable. You do not necessarily make both of these plans for all the identified risks. Instead the contingency plans are made for the risks which are under your threshold and flashes enough warning signs in advance. You are going to address a gathering of professionals, if the car tires get busted than it will result in delay of twenty minutes and you may miss your speaking slot. You take one car along, someone follows you, and in case there is any problem in the car you are traveling you change the car. You keep some buffer time and if something happens to car tires, you change them and since you have timed buffer you still reach on time. You identify actions which you will take in advance irrespective of the occurrence of risk You plan actions, but you monitor certain warning signs. You take these actions only when you see the warning signs. We are expected to mitigate the risks which are outside the risk threshold. 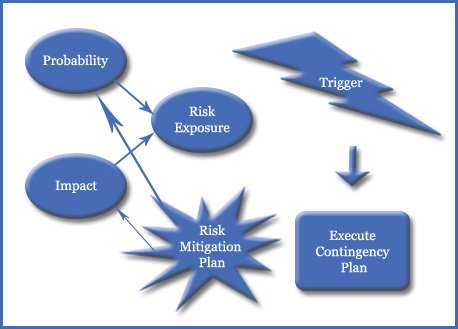 By applying a mitigation plan, we reduce the probability of impact of the identified risk. By identifying the contingency plan, we do not change the probability or impact of the current risk, but we plan to control the impact as risk event looks like occurring. This works as the first level of defense for the high exposure risks This works as a fallback plan for the high exposure risks. Know the difference between mitigation plan and contingency plan. Risk management is a crucial topic from PMP® certification exam point of view. Is mitigation applicable to all risk in this world by default? Is contingency only required for risk whose exposure value is beyond the threshold limit? When to implement contingency when it occurs or before it occurs?Coz when the risk will occur it will become issue and issue treatment plan will be carried out.So when is d right time to implement contingency? Just to add one more point to your existing explanation . In the above statement, you have explained about reducing the Risk by Reducing the IMPACT of it. “Doing a regular health- checkup” of the car especially before going on a important trip. Please let me know if the above plan can be considered as a Mitigation plan else correct me.